Hi ladies! I know it's been a while but I'm back, so let's get right into the look. I'm sure many of you are aware of the look that June Ambrose wore on her show, Style by June, mixing neon, leopard and cobalt blue, so this outfit should look very familiar. I decided to do my own interpretation of the look and make it my own. June's look was more of a men's inspired look with a chunky sweater and leopard jeans, so I put more of a feminine twist on it just to incorporate more of my personality. The bare shoulder top and the pencil skirt adds touch of feminity and power, without being too girly. Remember, inspired looks are not supposed to be verbatim, it's about taking inspiration and adding your own special touch to make it more YOU! I love this!! This is such a bold look and you look great in it! Work girl! You are so pretty! Love the entire outfit! I remember this look and you nailed it! Love it! I love your inspired look. You nailed it. I love this outfit! I love how confident you look in it! Love this!! You look amazing!! I love this outfit and your interpretation. I have the same skirt and wore this weekend with a black and white striped tank and sleeveless jean vest. I'm definitely incorporating neon the next time I wear it. I don't watch the show, so I haven't seen the look... but I must say that you look FAB!! 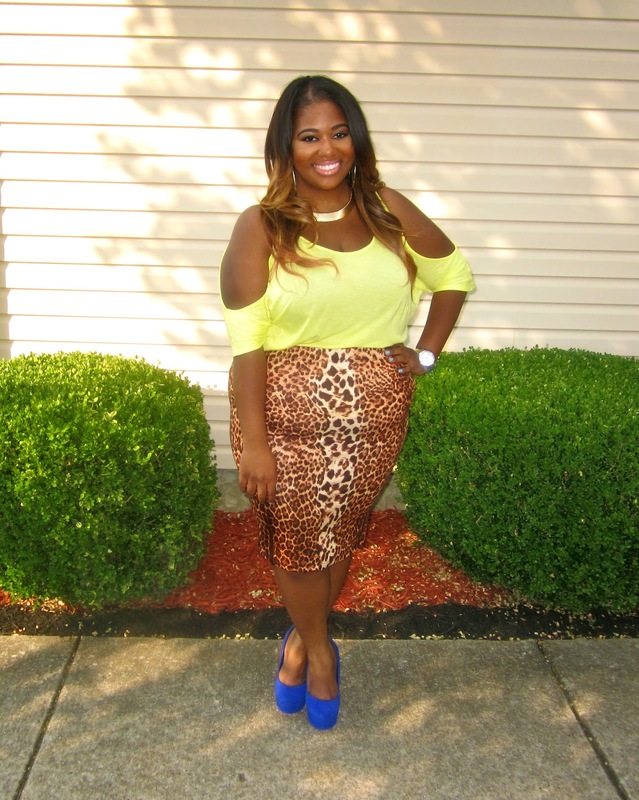 Love the neon and leopard together! Great look. I love the cut-out top. You really look amazing. You look stunning! Your hair is amazing! I love this look mam!!! You are absolutely beautiful and the outfits is great. However, I feel as though shape-wear would have been beneficial to your look.. Keep up the great looks! The colors are wonderful. Love the hair! FLAWLESS! I love the feminine touch you gave this tough print. I'm not sure that shape-wear would do any better to the outfit. But I guess to each it's own. Not really a fan of them. HOT! I need this shirt in my life! LOVE! Glad I found this site. Will start doing OOTD's on my blog as well. I need some inspiration!!!!! love it hun :) you look soo pretty!!! this is a great look. i am new to your blog, i hope this doesn't offend but you look much smaller now than you do in your older photos. kudos to you, but either way you're a beautiful woman with a ton of fashion sense. keep the hot outfits coming!